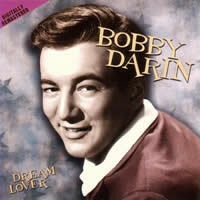 Dream Lover was written by Bobby Darin - musician, singer-songwriter and actor. Recorded: April 6, 1959 and released in the same year. Please Note: The live version starts in C Major with a key change to Db Major. The sheet music is written in C Major with no key changes. For Beginners: We have charted the entire song in C Major. If you want to play with the video, place a capo on the first fret. At the key change, stop the video - move the capo to the 2nd fret and continue. Born: Walden Robert Cassotto on May 14, 1936 in East Harlem, New York City, New York, U.S. He was a musician, singer-songwriter and actor who played a variety of instruments including guitar, piano, drums, harmonica and xylophone. Died: Dec 20, 1973 (aged 37) Los Angeles, California, U.S.
BOBBY DARRIN chords and lyrics are property and copyright of their owners. "Dream Lover" chords and lyrics are provided for educational purposes and personal use only.